A classic gravy is the combination of meat juices left in the pan, thickened with a roux and extended with stock. Every cook has their own interpretation, though. Some may resemble more of a jus – using a clear stock or wine to deglaze a pan. Some may resemble a more old-school gravy – starting with gravy granules, or thickening with cornflour. However you make yours, one thing remains true – gravy has been integral to the Great British cuisine for centuries. What else would fill a Yorkshire pudding? What else would bangers and mash float in? What else would heat up a slice of beef that got cold while you were doling out the Sunday roast? The easiest, and perhaps the most popular way to make gravy is to do it in the same tin the bird has just been roasted in. Whether chicken or turkey, simply thicken the meat juices with a bit of flour, vigorously stir out the lumps, and then extend with some stock enhanced with a splash of wine. 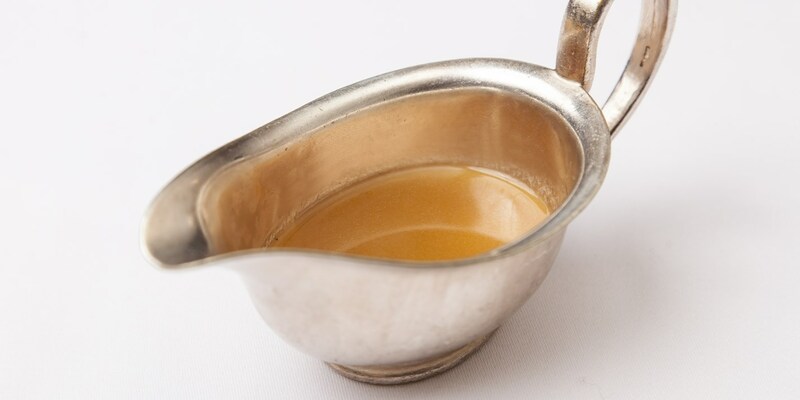 Once the gravy has thickened, then (optionally strain and) pour into a pre-heated gravy boat. The stock that you pour in the pan accounts for a lot of the flavour, so the quality of the stock will have a big influence on the quality of the gravy. If the bird has any extras – turkey giblets, grouse hearts, chicken neck and gizzards (but not the liver as it can develop a bitterness) – then brown in butter, add diced onion, celery and carrot. Pour water over the meat and vegetables, simmer and strain. Of course, fresh or frozen homemade stock made from leftover carcass is a fine addition to gravy. It's common to flavour poultry stock with a squeeze of lemon. But a flick of mustard, splash of tarragon vinegar, or even a spoonful of crème fraîche to lighten the gravy are all options. A popular way to enhance gravy is to harness the vegetable trivet trick, where the bird is cooked on a bed of carrots, onion and celery to add extra flavour to the juices in the tin. Most people automatically reach for a bottle of white wine when making poultry gravy. But red wine might be used for darker game birds such as grouse or goose, along with a little redcurrant jelly, perhaps. As with poultry-based gravy, the easiest method is to make the gravy in the roasting tin. To do this, remove the beef or lamb and set aside to rest. With fatty meats, it is often advisable to skim off some of the fat before beginning. A fat separator jug can be useful for this. Add a couple of tablespoons of flour to the pan, and stir vigorously on the heat. Remove from the heat and pour the stock in – little by little, stirring all the time, making sure that all the tasty meat residue is scraped off the pan into the sauce. Once it has thickened, then (optionally strain and) pour into a pre-heated gravy boat. It would be unusual to use beef or lamb stock in a chicken gravy. But it's not unusual to add chicken stock to a beef or lamb gravy. Veal is another popular option, famed for its richness. As with any gravy, the quality of the stock accounts for much of the flavour, so try to use a good homemade stock. It's common to add red wine to the gravy along with the stock, and a dash of port adds a wonderful richness. Redcurrant jelly is a traditional sweetener – with one or two teaspoons often being added to lamb gravy. Other popular additions are tomato paste, Vegimite or Worcestershire sauce.